It is my absolute joy to inform you all that NO DOMINION is now available for general purchase! Via Barnes & Noble, for your Nook! Via Amazon, in print or for your Kindle! 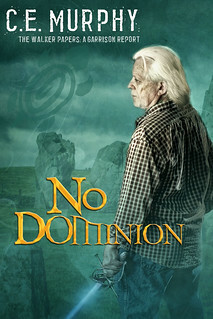 NO DOMINION itself is a short novel about Gary Muldoon, Joanne's septuagenarian sidekick. People have been asking me about Gary's story since the series began, and partway through RAVEN CALLS, the opportunity to tell it leapt up and throttled me. I wrote it for my Kickstarter patrons, and now it's available for everyone! I would dearly, dearly appreciate it if anybody who has already read it felt moved to go write a review for Amazon and/or B&N.com, and I would equally appreciate any signal boost you felt like providing. The problem with self-publishing, even if you're a known entity, is making people aware of the book, since it won't be on the shelves for readers to just trip over. I am just starting the book, but will happily post a glowing review on Amazon and Goodreads when I've finished, and signal boost as much as I can. And you're always welcome to do a guest post on my blog, if you think that would help. Re- Smashwords: Have you enrolled in the premium program? That distributes your books to a lot of stores, including Apple, Kobo ( which means you get WHSmith and FNAC too) and even libraries ( I think). I have been trying to figure out whether or not I need to buy this now or if I can wait until I can better justify a more frivolous expenditure like books that are purely for pleasure. This is the only crowdfund project that I missed out on so I don't want to miss it again. But I would much prefer the paper copy and I'm not sure how the lulu.com publishing works. Do you know if there is a limited time frame that I'll be able to order the paperback copy? Or how I could look up what the time frame is if you think there might be one?